1. Haanja Marathon is a part of Estoloppet 2019 calendar race. Haanja marathon is organized according to Estonian Ski Association (ESL) and FIS precisions, Estoloppet main manual, this manual and programme and the decisions of organizing team. 2. 44. 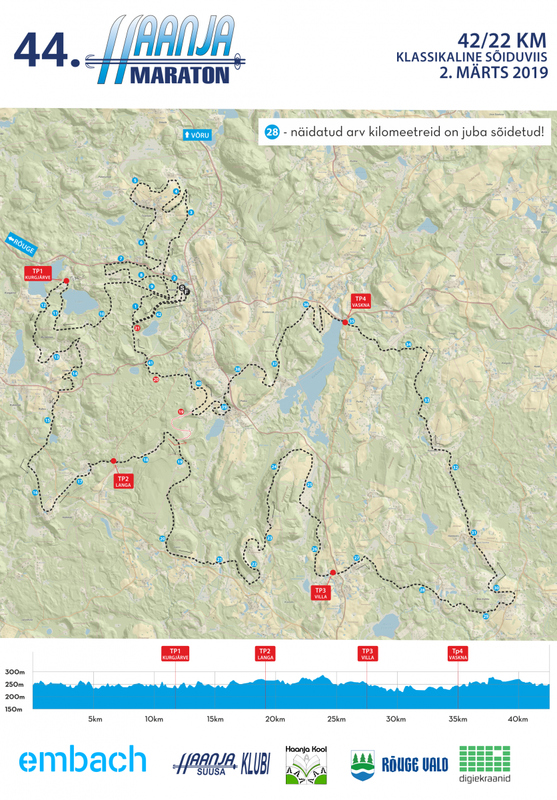 HAANJA SKI MARATHON will take place on 2. March 2019. Start and finish are located on Haanja ski stadium. Haanja Marathon is organized by a team formed by Haanja Suusaklubi with the help of sponsors and supporters of the marathon. On 42 km course are 4 feeding stations. On 22 km course are 2 feeding stations. 4. . Minimum year of birth to participate long distance is 2004 and for short distance 2006. Participants should be healthy and enough trained to complete the course.Participants who are born later than 2004 and 2006 are allowed on the course if they take part under the responsibility of the parent. 5. All participants are responsible for their own health and fitness. 6. Medical help is offered according to scheme by a medical worker approved by Haanja Marathon. First aid is given in feeding stations. If one notices people in need of help on the course, we would like one to inform the nearest feeding station, a medical worker on the course or emergency number 112. Participants under 18 and pensioneres of Estonia will have 50% discount in first two rounds. Changing entry – 10€ + difference between entry fees. Entry fees wil not be refunded when one chooses not to participate. If Haanja Marathon is cancelled because of reasons not caused by organizers, entry fees are not refunded. Short distance (20km): M/N15 (2004–2006). Rest of the participants will complete in overall age group and have no separarte age group prize. 10. For preregistrated participants 42 km starting groups will be calculated by using Estoloppet 2019 marathons’ results. In means of the safety of the start, the main organizer may also add the members of cross-country skiing and biathlon groups to the first start corridor. The main organizer also has the right to make changes in other start groups. Participants who start from the wrong corridor will be disqualified. There are no start groups on the 22 km course. 11. Starting bibs (numbers) will be handed out at the registration in the starting location 01.03.2018 at 16:00-18:00 and on the day of the marathon 8.00-10.30am. 12. Changing entries is possible only by writing a email to haanja@estoloppet.ee not later than the last Wednesday (27.02) before the competition by 17.00. The fee for changing entries can be paid when getting the start number. There will be no changing entries later (not for person to person nor changing distances). 13. The participants are guaranteed with prepared course, starting bib, timekeeping (if starting bib is correctly worn), result in final result list, service in feeding stations and in finish. A diploma with a name, time and location can be printed out from www.estoloppet.ee website starting from next Tuesday after the competition. 14. Awarding ceremony takes place on the skiing stadium at 14.30pm. In 42 km distance 6 best Men and 3 best Ladies are awarded with trophy. In 22 km distance 3 best young men and 3 best young ladies M/N15(2004 - 2006) are awarded. 15. Finish will be closed at 16.00. Crossing the limit means automatically DNF. Lost and found things should be given to the chief of the feeding stations who will hand them over to secretaries in the finish. Lost and found things can be received in one month after the marathon by calling on the number +372 5296194 or sending an email to haanja@estoloppet.ee. On reasons not caused by organizers, the organizers may change or shorten the courses or cancel the marathon. 16. All protests for results and violations of the regulations for the first 50 finishers will be accepted in 1h after the 50th finisher has finished. For other competitors protests are accepted in the secretariacy until 1h after closing the finish. Protest fee is 35€ that will be refunded only if the protest is met. All protests related to the competition are solved by the jury consisting of the main organizer of the marathon, chief of the courses, technical control, technical delegate. 17. The parking lots (charged and without charge) are marked on the map of the competition centre. Cases that are not mentioned in the manual will be solved during the process by the organizing committee.